“There is nothing like working for yourself! Besides I wanted to do something more meaningful than just increasing the annual turnover of a MNC. 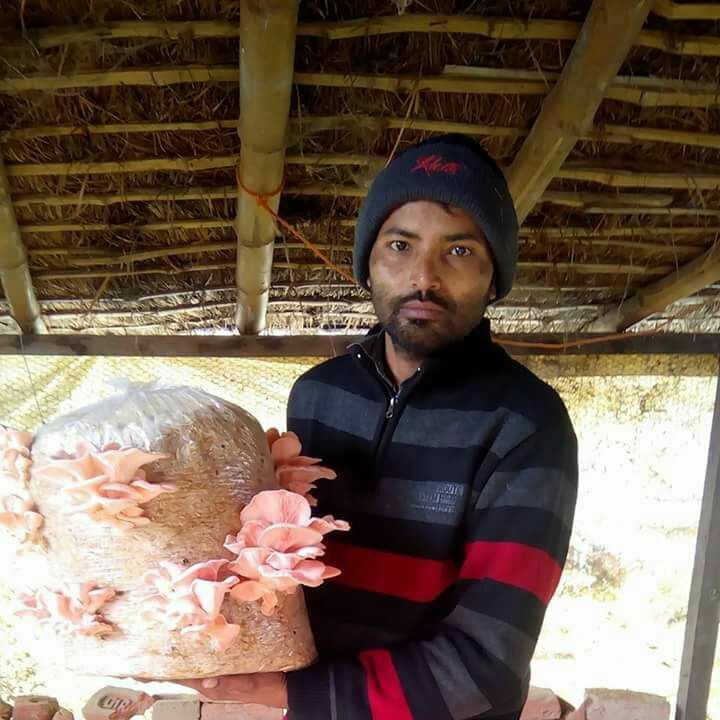 Thus in 2013 I left the job in Delhi and joined my family business of mushroom cultivation. I was having reasonably good know-how of the business and it was progressing well. However after I joined I increased the production capacity (oyster:200 quintal, button:50-70 quintal and milky:50-60) and made the operations more organized. All was fine but I observed fellow mushroom growing farmers in my village and neighboring areas faced the problems in production and marketing. Also I wanted to bring down the production cost for everyone. Therefore I thought to form the farmers group and work collectively,” shares Mr. Mahendra Pal Gangwar, progressive farmer and founder member, Leeward Golden Mushroom Farmer Producer Company (LGMFPCL). It is located at Kuraiya village, Berkheda, Pilibhit district, Uttar Pradesh. Presently there are 200+ active farmer members in the group. Only prerequisite to become member of the group is that farming should be his/her livelihood. The main season for growing mushroom is September to April. 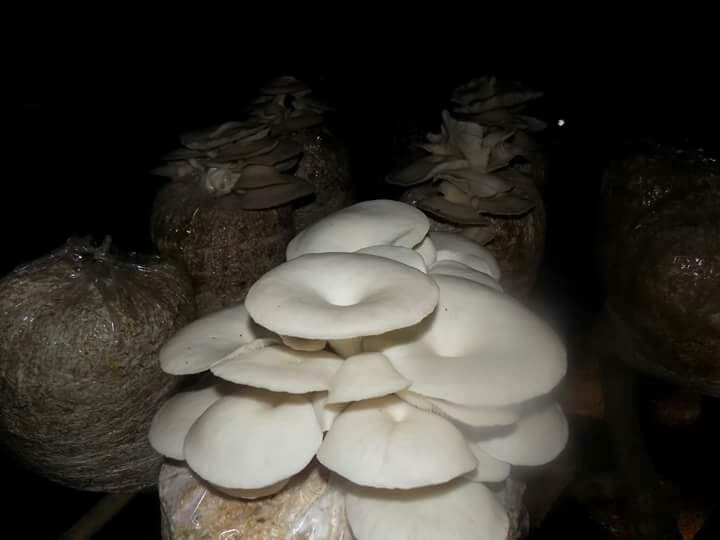 Commonly the farmers grow four varieties namely oyster mushroom (growing period- one month), button mushroom ( 65-70 days), milky mushroom( 65-70 days), and puaal mushroom (18-20 days). “We all members work jointly. It implies we buy mushroom spawns in bulk from Agra (@ Rs. 85/kg) and then sell our respective farm produce in bulk in the local market. It not only brought down our individual farm’s production cost but also gave us the strength and confidence to solve all the problems faced in cultivation. In addition we saved ourselves from price exploitation and we are achieving much more by working alongside one another,” he asserts. One of the major milestones acquired by LGMFPCL is establishing Spawn Production Laboratory with the capital investment of Rs. 4 lakh. Money was given by the members as per their share. “Now there is no need of buying spawns from Agra! We are self independent.” Farmer members are also processing the unsold mushrooms into mushroom pickle and selling it across the state. The demand of mushroom and its pickle have increased substantially. In Uttar Pradesh state most the farmers grow mushrooms on wheat husk bed as it is easily available. It is a simple process yet the production intricacies involve maintaining the right temperature and humidity. “We place the digital meter in the mushroom growing room to keep a close check on these two factors. Humidity required in all mushroom varieties production is 80% whereas the temperature varies. In button mushroom temperature should be 14-24 degree Celsius, oyster – 18-30 degree Celsius and milky mushroom – 25- 35 degree Celsius. If these two factors are monitored well then production will surely be good,” he claims. When asked about the financial transactions in the company, Mr. Gangwar clarifies, “We have made stringent rules and regulations therefore every rupee spent is well recorded. There is no chance of any manipulations or fraud!” All investments and plans are proposed 15 days prior to all members and decision is taken only after voting. It is a well planned system. 60 per cent of profit earned by the producer company is given to the members as per their share and 40 per cent goes to the reserve of the company for other initiatives. Future plans of the company are to increase the production, start value addition process with mushroom protein powder and soup. “Lastly we want to begin cultivation of medicinal mushroom variants such as coriolus, cordyceps, maitake, reishi and shiitake etc,” he states.